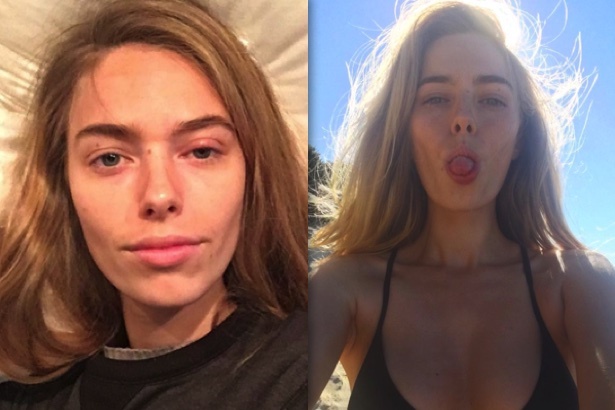 Last week, Australian model Anthea Page took to social media to reveal she had contracted golden staph from a makeup brush while on set during Sydney Fashion Week. What started off as a vent to her 90,000 followers soon grabbed the attention of the international community as Page was forcing a conversation spoken usually in hushed whispers – if at all – makeup hygiene. Page spoke to theFashionSpot about her recovery back to health, and how to ensure the problem never happens again. Having been on strong medication for the past 10 days, the aesthetic damage has begun to subside, Page rejoices, “It’s such a relief to be able to see again,” but she’s also well aware that this is an infection that could stay with her for life. The infection took to Page’s right eye, and she says she was ordered by doctors to take “a month off work – a month without makeup” which ultimately impacted her income, given there were “a fair few” cancellations from clients with tight deadlines. Page anticipated this, but what took the rising star by surprise was just how prevalent this hardly-discussed OH&S hazard really is. The issue of proper makeup hygiene isn’t unique to Australia and happens “worldwide” according to Page. However, the reluctance of suffering models to come forward, bar rare cases such as Hungarian model and actress Barbara Palvin, makes it a difficult fight to win. A reluctance that Page understand. As Page sees it, there’s an obvious solution to ensuring what happens to her never affects another model. Currently, the code of conduct for professional makeup artistry is “not a law, just a guideline” something Page feels needs to change. Change can be made at a grass roots level too. Page has some sage advice for civilians who wear makeup and use sample products.